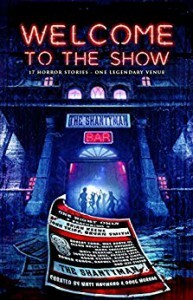 WELCOME TO THE SHOW is a themed anthology with all of the stories revolving around, (or involving in some way), a rock n' roll club named The Shantyman. That's it! There's no hard thread connecting all the tales other than the club itself. That makes WELCOME TO THE SHOW different because there's no one "bad guy" to blame things on. In this case, the "bad guy" is anyone or anything the writer wanted them to be. In this regard, I think the authors involved had a lot more leeway as far as the direction each story would take and I think that resulted in an above average anthology as far as the quality AND the variety of the stories within. NIGHT AND DAY AND IN BETWEEN by Jonathan Janz. This story went in a totally different direction than what I had expected. Loved it! TRUE STARMEN by Max Booth. I'm not sure that it was supposed to, but this story cracked me the hell me up! It's the first time THE SHANTYMAN hosted pod-casters instead of a band, and the results just made me laugh. OPEN MIC NIGHT by Kelli Owen. The 27 Club-you know, those singers and musicians that never made it past that age? I thought this anthology would be a shoe-in for stories about that club, but this was the only one. I was glad because it made this tale stand out even more. PARODY by Jeff Strand. Zany Chester and his plans to be the next Weird Al fizzle out before they even got started. (It's birdies, not bodies!) Chester had to go to a few back up plans, actually, and none of them were pretty. DARK STAGE by Matt Hayward. This tale spoke to me in a personal way which made it that much more horrifying at the end. A TONGUE LIKE FIRE by Rachel Autumn Deering. The end was NOT what I was expecting at the beginning. Usually I can see that coming..in this case I saw something coming, but not what I got. Well done! Brian Keene's tale RUNNING FREE made me laugh at the premise before it got all serious. (A man trying to run himself to death by heart attack, thereby evading death from the cancer already running through his body. Come on, that's kind of funny! [All right, I know I'm messed up.]) Anyway, this story didn't go the way I thought it would and I loved how it tied into previous tales in this book. WE SING IN DARKNESS by Mary SanGiovanni. This story had everything that I've come to expect from Mary's work. A terrifying future where music is banned is only the beginning. I enjoyed this collection and even though it was a little uneven throughout, the variety and quality more than made up for that. I liked that everyone didn't have quite the same view was to what was going on at The Shantyman because that allowed for more creativity in the tales. Variety is the spice of life and all that, you know? I read a lot of collections and anthologies over the course of a year and there is no doubt in my mind that WELCOME TO THE SHOW will be among the best I've read this year. For this reason, I highly recommend it!